Irish traditional music has experienced quite a renaissance in recent years. A combination of interest in World Music, ethnic awareness, and the many Americans who claim Irish heritage has helped spark a great renewal of interest in the music of Ireland and the Celtic lands. Irish music in America used to mean songs like "When Irish Eyes are Smiling" sung by a big-voiced tenor with full orchestral accompaniment, or maybe the Clancy Brothers singing drinking songs. But thanks especially to work of the Chieftains, those durable ambassadors of traditional Celtic music; audiences around the world are coming to know the pleasures of genuine Irish jigs, reels, airs and traditional songs. The Chieftains have collaborated with pop performers both from within and outside of Ireland, including Van Morrison, Sting, Marianne Faithfull, Nanci Griffith, Mark Knopfler, and even Mick Jagger and the Rolling Stones, all of whom seemed anxious to appear on the Chieftains' albums. A few of these same performers have brought elements of traditional Irish music into their own recordings. In addition to the Chieftains, a generation of Irish musicians and bands have been very active, with many of their recordings seeing release on this side of the Atlantic. Meanwhile, some performers who started out in traditional music have spun off new styles, specifically Clannad and Enya, that mix dashes of the traditional with the sonic ambience of New Age-style synthesizers. And even more recently there was the great success of the theatrical dance production "Riverdance" based on traditional music that has been touring this country. Not surprisingly, with the interest in Irish music on the rise, younger musicians are entering the field and already making significant contributions. This week's album is an excellent example. It's the eponymous debut by a quintet called Solas, which means "light" in Irish. 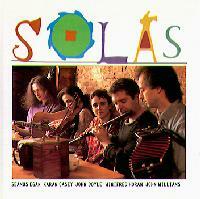 Solas is also typical of another phenomenon in traditional-style Irish music -- it's a bi-continental group. They spend most of their time in the US, being based in Philadelphia, but have members from both this country and Ireland. Solas' most prominent member is 26-year-old Seamus Egan, who has already developed quite a reputation, being the only person to win the All-Ireland Championship on four separate instruments, tin whistle, flute, banjo and mandolin. He was a member of a group called Chanting House, and last year created the soundtrack for the film "The Brothers McMullen." Sarah McLachlan made a hit out of Egan's composition Weep Not for the Memories which she turned into her song I Will Remember You. And just this past February, Egan released a solo album When Juniper Sleeps that has become something of a hit in the New Age world, with its gentle instrumental sounds. Solas puts Egan in the company of other similarly stellar young musicians. They have a passion for traditional Irish sounds, but also a penchant for creative arranging and musical sophistication that not only makes for great virtuosic performances of danceable jigs and reels, but also adds subtle but creative touches like sophisticated jazzy harmonies. The other members of Solas are fiddler Winifred Horan, whose background is in classical violin, studied at the New England Conservatory. She was also a part of the group Cherish the Ladies and collaborated with Egan on the music to "The Brothers McMullen." Guitarist John Doyle was also in Chanting House with Egan, and has worked as a studio musician with such Irish music notables as Mick Moloney, Eugene O'Donnell and Eileen Ivers. John Williams plays accordion and concertina, and is the only American to have won the all-Ireland concertina championship. Rounding out the group is singer Karan Casey whose has an academic background in both jazz and classical singing. For the latter, she studied at Royal Irish Academy of Music in Dublin, while she pursued jazz at Long Island University. Solas' album brings together a wonderful combination of superlative musicianship -- they can play quick-tempo reels with remarkable precision; youthful enthusiasm -- they sound as if they are really enjoying what they are doing; and musical sophistication -- their arrangements avoid many of the clichés of Irish music. Even their selection of tunes is interesting -- almost all the material is traditional, and yet most of the pieces are rarely heard and may well be new to even many traditional Irish aficionados. Though all the standard Irish instrumentation is available to Solas, they tend to use the Uillean bagpipes and the bodhrán drum infrequently. Instrumental pieces comprise the majority of the album, with just five of the thirteen tracks featuring Karan Casey's appealing vocals. Some might wish for more of the songs, but Solas' instrumental performances are exceptional, and with their arrangements favoring guitar and flute, even those who might not usually care for Irish tunes because of the sound of the bagpipes or scratchy fiddles, will find Solas' music very enjoyable. There are a lot of fine Irish bands about these days making traditional music, but on their debut recording as a group Solas, with album Solas distinguishes itself as one of the finest young ensembles around. This quintet, based in Philadelphia with members from Ireland and the USA, combines spectacular musicianship with considerable imagination in their arrangements, and a distinctive choice of traditional material. Add the engaging vocals of Karan Casey and the result is an album sure to delight fans of Celtic music. And with Solas' enthusiastic yet sophisticated presentation, they may win a few more converts to the joys of traditional Irish music. In terms of sound quality, the album, which incidentally was recorded in the studio famous for the Philly soul sound, features nice clarity on the acoustic instrumentations, but the mix has too much compression for an all-acoustic group, giving the album a sound that lacks much dynamic range and seems too up-close. All in all Solas the album marks a very impressive debut by group showing how vital the traditional Irish music scene is today.